On 18th January Gallery O Art Space opened its doors to Atif Khan’s Solo Show titled “Heartscape”. The walls of the gallery, at first glance, seemed to be awash with ebullient colour, humming and glowing amidst shifting mosaic-like compositions derived from the aesthetics of miniature painting. Birds with forms derived from truck art motifs flew, giant fish swam and surreal scenes of mango trees in bloom replete with psychedelic colours and optical illusions assaulted the senses reminding us that the cornucopia of detail in each painting warranted a closer look. These were more than just reinterpretations reminiscent of Ragamala, Persian or Mughal paintings amongst other styles: Khan, as the title suggested was attempting to contest the very concept or meaning of landscape painting today by revisiting our understanding of this style in the twenty first century. The exhibition featured fifteen digital paintings- digital collages to be precise- that were executed as archival inkjet prints on Hahnemuhle paper while the iconography and stylistic elements in each collage had been appropriated from various schools of miniature painting. This in itself made the works distinct from traditional miniature paintings executed in gouache because they eschewed glorification of painterly skill and virtuosity which is a hallmark of this style while the pastiche of motifs taken from different miniature paintings, styles and genres questioned authenticity and representation in a digital age of mass production. Ragamala paintings are a genre whose emergence can be traced back to the second half of the fifteen century. Its root word “Raga” means colour, mood and delight and the paintings themselves each of which which revolve around themes of love, loss and union are visual renditions of musical modes. These modes are represented by seasons such as summer, monsoon, autumn, dawn, dusk etc. 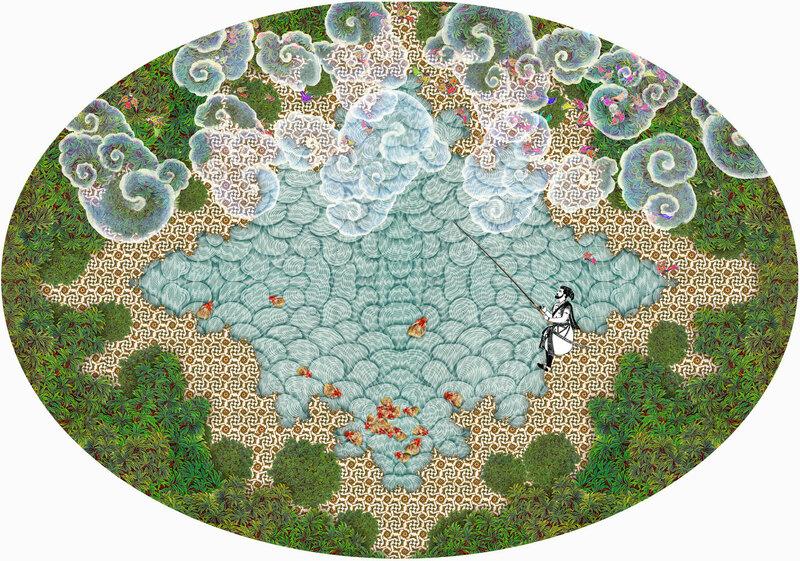 Khan’s digital collages also referenced such modes and were characterized by stormy skies with scalloped Persian clouds, turbulent waters and a lone Mughal figure who was literally, it seems, “fishing” for love as he tossed out human hearts (the irony and humour was not lost on viewers). The images too were evocative of specific poetic moods and he deftly demonstrated his familiarity with the concept of “rasa” or essence so that we could engage with the artworks but were these images really about the trials of love? On a subliminal level it was this question and the ambiguity inherent in the images that engaged viewers constantly: one was undeniably overcome by the “rasa” inherent in some of the works; whether it was the luminescent lapis lazuli hue of “Flight in the Night” that moved or the sound of thunder one heard amidst the hoof beats of horses galloping against a sweeping sky of monsoon laden clouds in “Monsoon-2”: we were affected, but many of the landscapes simultaneously unsettled for they were spaces where the laws of the natural real world as we know it did not apply and where multiple realities verging on the nonsensical converged. Ironically it was the arena of this surreal and nonsensical space that helped Khan effectively unveil his real concerns. Baudrillard in his seminal work “Simulacra or Simulacrum” called them, “hyperreal” spaces which had no origin or reality but Khan was using them to talk about dilemmas that plagued our everyday existence. “Nayher wala Pull” for example featured a bridge whose geometric motifs seemed to derive from mother of pearl inlay work often seen in places like Morocco, Spain etc. but was illuminated by French lanterns, the trees reference perhaps Pahari School and Ragamala paintings. This pastiche of elements was completed by the presence of star barriers often seen around our cities at checkpoints reminding viewers that this idyllic setting was an illusion that masked the conflicts and realities of our everyday lives. Khan’s compositions on the other hand subverted this virginal space to reveal rather than dissolve “the disequilibria of the mundane world” as Nasr describes it for his compositions such as “Seven Skies” which featured teetering worlds, unstable skies and even contained chaos implied by anxious shoals of fish swimming in stormy waters signaled a simmering imbalance in the fragility of nature- and perhaps our world itself. Nasr also goes onto describe space in Persian miniature painting as “… itself a recapitulation of the space of another world and concerns another mode of consciousness”. Abul Hassan, Emperor Jehangir’s favourite court painter used such an otherworldly space to translate Jehangir’s modes of consciousness into dream paintings that inadvertently painted him as a megalomaniac standing high on top of a globe held up by a calf and a large fish, shooting his enemies. 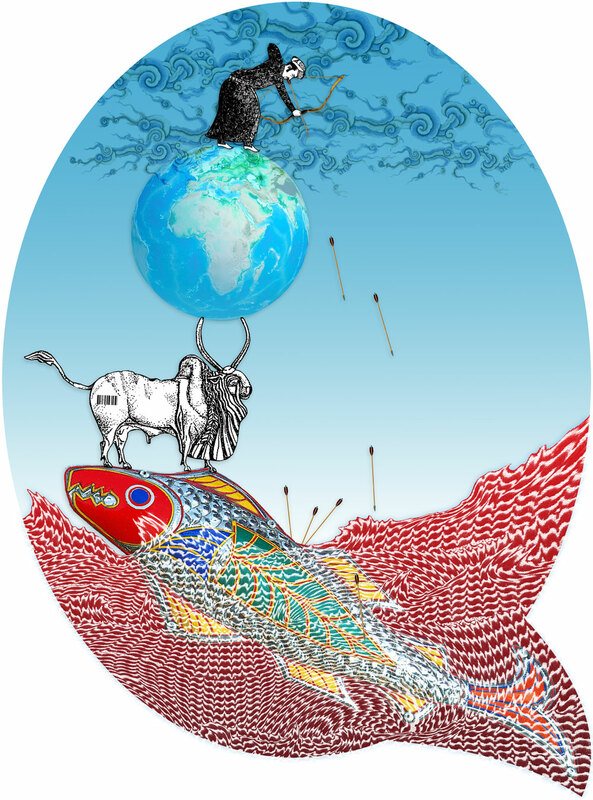 Khan appropriated this composition in “Mindmap-1” by showing Jehangir shooting the very elements that are keeping him upright and afloat in the composition: a giant fish motif inspired by truck art and a buffalo appropriated from an Indus Valley seal and tattooed with a barcode. Are our modes of consciousness now being defined by these emblems of conflicted historical pasts and postcolonial chaos? “Heartscape” seem to prompt us to consider the possibility that we now live in a world where nothing is original and matters of the heart have been discarded in favour of a new world order where anxiety and discontent rest just beneath a veneer of verdant utopias.